I think the most popular dish for Rosh Hashanah (the Jewish New Year) is The Silver Palate's Chicken Marbella. It is a dish of marinated chicken pieces in white wine, prunes, brown sugar and a whole bunch of other ingredients. You get it started the day before and it's delicious. It gets even better the second day and even the third day. 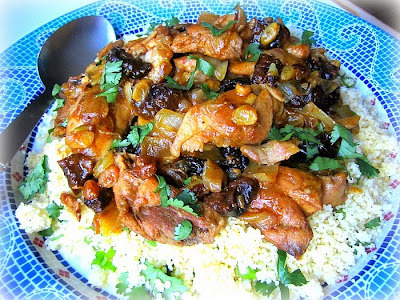 This year I decided to try something different, so I am going with Rachael Ray's Chicken Tagine w/ Prunes. I have made it many times before, and it's the perfect make ahead dish for a crowd. 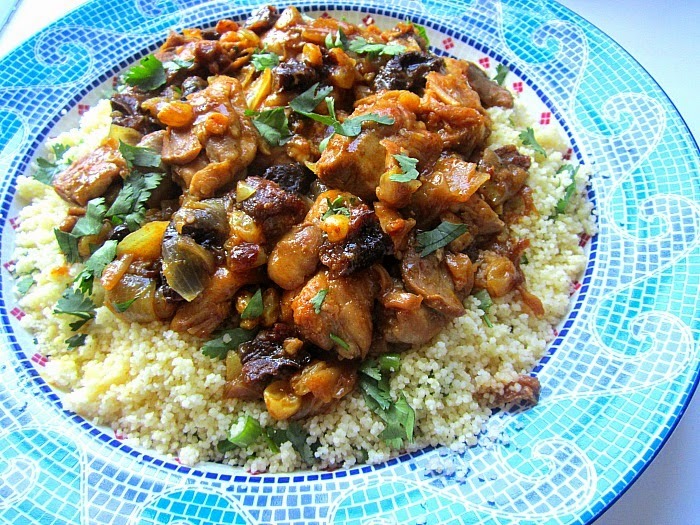 Similar to the old faithful, but much quicker to make, and delicious served on couscous. 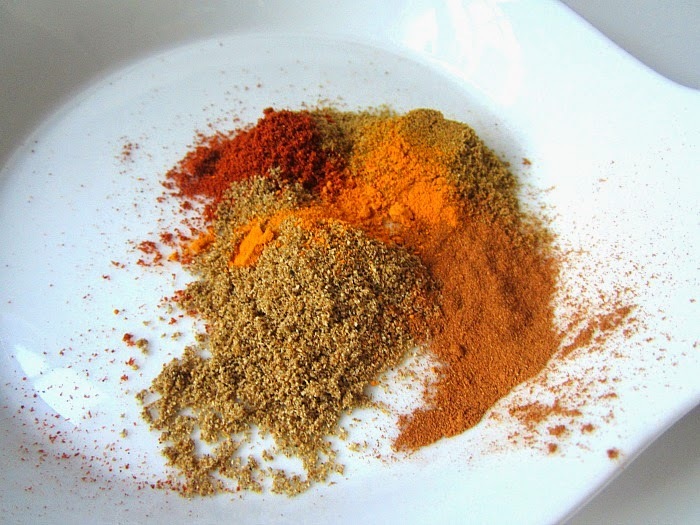 It is more of a Sephardic (Jews from the Iberian Peninsula) tradition to serve things over rice or couscous, than it is an Ashkenazi tradition. The original recipe uses boneless chicken breasts (too dry for me), so I changed it to boneless, skinless thighs. Much better for a crowd and they won't dry out when they sit in the sauce. Season the chicken with kosher salt & pepper. Heat a large skillet over medium high heat. Add olive oil, and add smashed garlic. Place the chicken in the pan in an even layer. 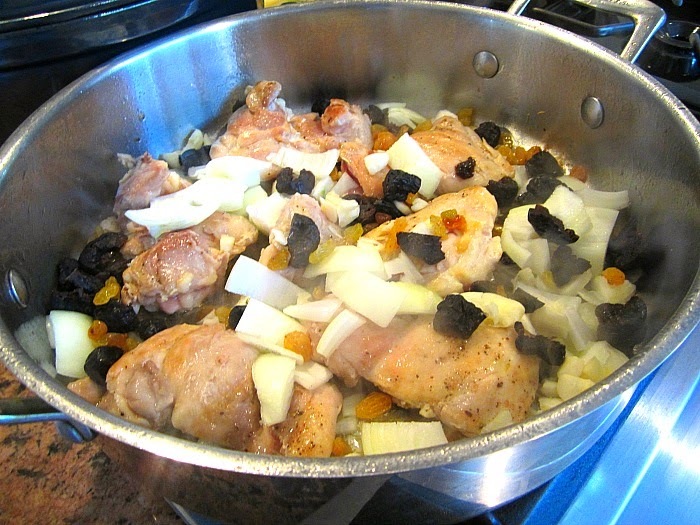 Cook chicken pieces 2 minutes on each side to brown, then add the onions, prunes and raisins. Mix spices in a small dish and scatter over the chicken in the pot. Reduce to moderate heat. Cook 8 minutes, stirring the chicken and onion mixture the whole time. Add the 2 cups of chicken stock. Bring to a boil, then turn down to a simmer and simmer about 20 minutes, until chicken is done. Let the sauce and chicken rest a few minutes. The sauce will thicken and be nice and glossy. To prepare the couscous, bring chicken stock to a boil. Add couscous, extra-virgin olive oil and scallions and remove the couscous from the stove immediately. Cover and let stand 5 minutes. Fluff with a fork. Serve the chicken on a bed of couscous on a big platter. Sprinkle w/ fresh cilantro and more green onions. Have a sweet Rosh Hashanah next week. Can you do this a day ahead and just reheat? What is the best way to reheat it? Can make this two days before. Keep in pan in fridge. Just simmer on low before serving and add the couscous just before serving! It's even better as it sits in the fridge. Thanks - I think I found my dinner.